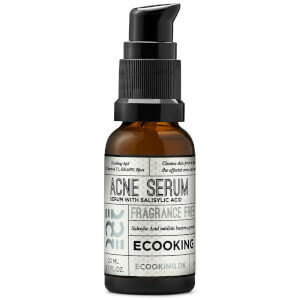 Clarify your complexion with Ecooking Acne Serum, a breakout-fighting formula for oily and blemish-prone skin. Formulated with Salicylic Acid to sweep away bacteria, impurities and excess sebum from the surface, the acne treatment can be used all over the face to decongest the skin or used as a targeted spot zapper. Weightless and non-drying, the serum leaves the complexion looking clearer, brighter and healthier. Apply a couple of drops on to the fingertips and apply on effected areas. Aqua**, Ethoxydiglycol, Pseudoalteromonas Ferment Extract, Sodium Salicylate, Glycerin*, Sodium PCA, Zink PCA, Salicylacid, Caprylyl Glycol, Hydrolyzed Wheat Protein**, Hydrolyzed Soy Protein**, Tripeptide-10 Citrulline, Tripeptide-1, Lecithin**, Butylene Glycol, Xanthan Gum, Carbomer, Triethanolamine, Phenoxyethanol, Sodium Levulinate, Potassium Sorbate, Citric Acid, Potassium Hydroxide.